Perfection in a Bottle - Perfection on two wheels. 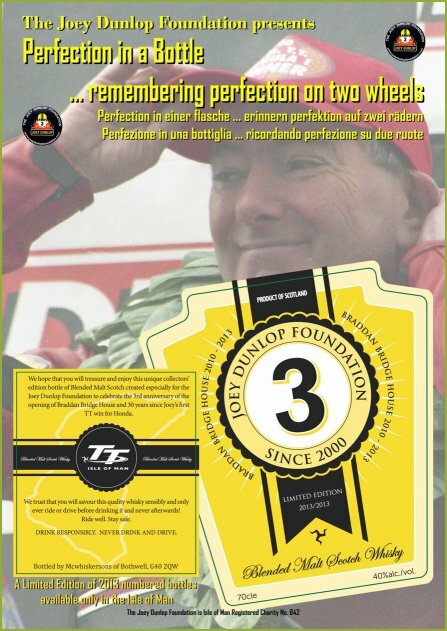 To celebrate this unique event, Joey's charity (Joey Dunlop Foundation), has purchased a consignment of a young, well matured blended malt whisky from McWiskersons of Bothwell Ltd.
With a specially designed label that commemorates both the 30th anniversary of Joey's first Honda win as well as celebrating three years since the charities holiday complex was opened, the limited edition of 2013 bottles will be in much demand. Each bottle has an unique number with the famous no 3 being presented to Mrs Linda Dunlop and no 30 to a representative of Honda, a company that has supported Joey Dunlop Foundation on many occasions since 2000. To comply with licensing regulations, the charity recruited the help of Martin Brunnschweiller of Bushy’s Brewery who readily agreed that he would sell the whisky from the famous Bushy's Beer Tent, Douglas promenade. 'The success of the accessible self catering holiday accommodation has far exceed our wildest expectations and in order to ensure that funds are in place to undertake the construction of two additional holiday apartments, we had to decide on something different and after months of research and liasing with the relevant authorities the decision to proceed with the bottling of this whisky was given in March 2013. In order to avoid disappointment please do not delay your purchase and remember do not drink before driving only after you have put the keys away.